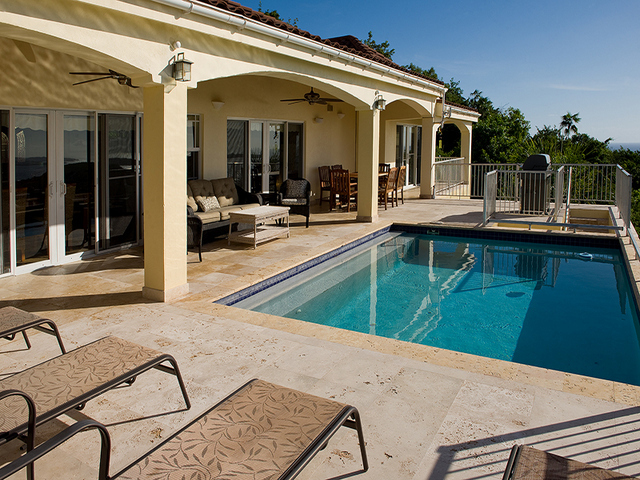 Exquisite 5 bedroom Luxury Villa with Pool! 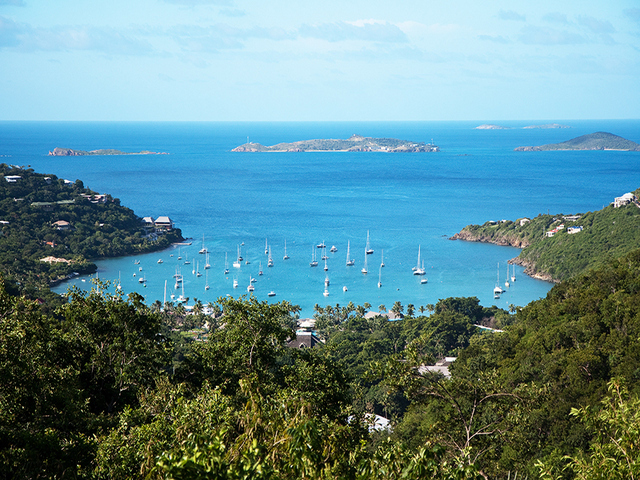 Exclusive Virgin Grand Location with Fabulous Panoramic Ocean Views! 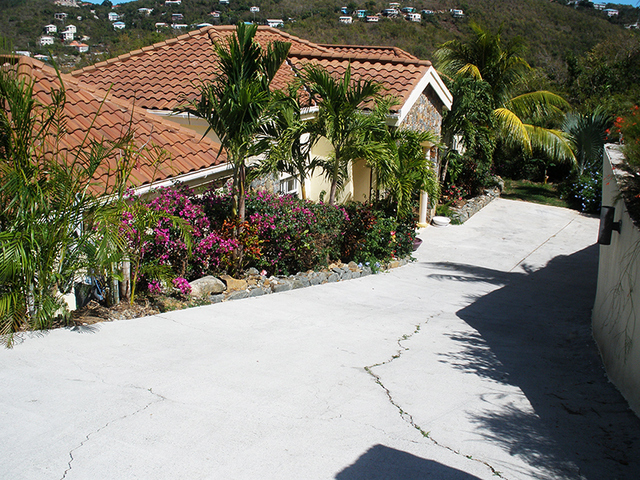 Luxurious Two or Five Bedroom Retreat in Private Gated Community of Virgin Grand Estates! 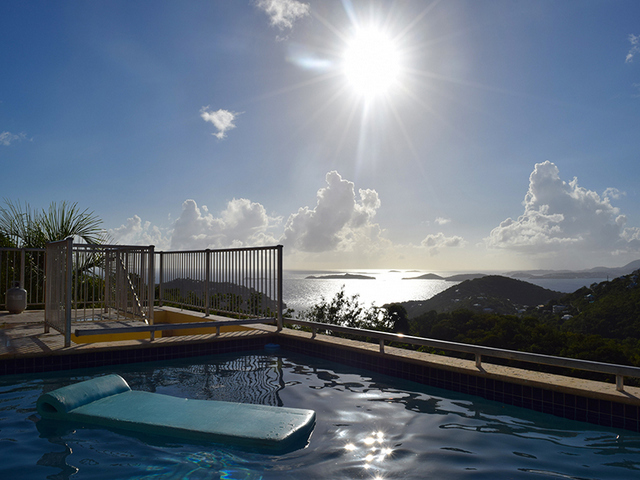 SWEET SURRENDER is a luxurious, fully air conditioned, 5 bedroom villa located high above sea level on beautiful St John, US Virgin Islands in the upscale, gated community of Virgin Grand Estates. 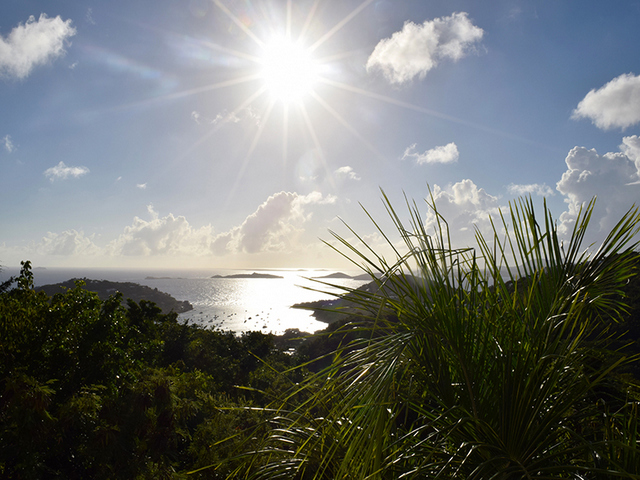 Affording breathtaking views to the southwest and west including St. Thomas and surrounding cays, Sweet Surrender is the epitome of ‘ambiance in the Caribbean’. 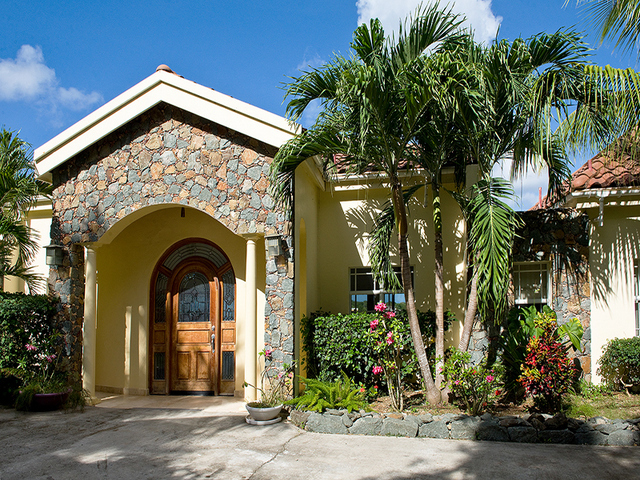 This spacious home features custom built exotic hardwood doors and cabinets, gorgeous tile floors, granite counter tops, contemporary lighting and finishes, and elegant furnishings throughout tastefully arranged by professional decorators. 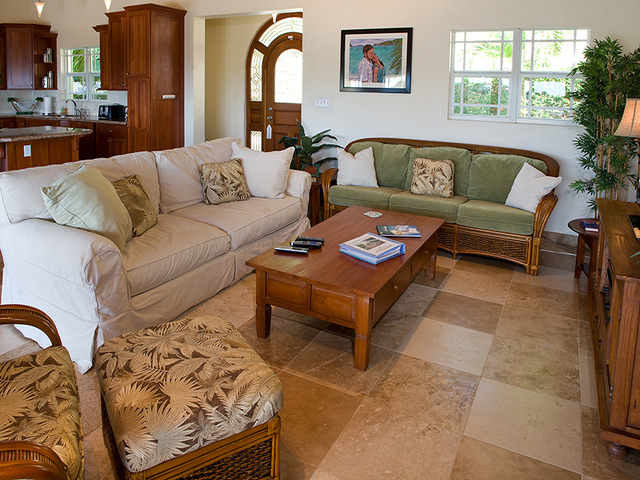 The Great Room offers two inviting sofas and a comfortable chair with ottoman for your lounging pleasures. A large flat screen television with satellite programming, DVD Player, connection for your MP3 player and audio sound system with indoor and outdoor speakers afford unlimited opportunities for music and video enjoyment. 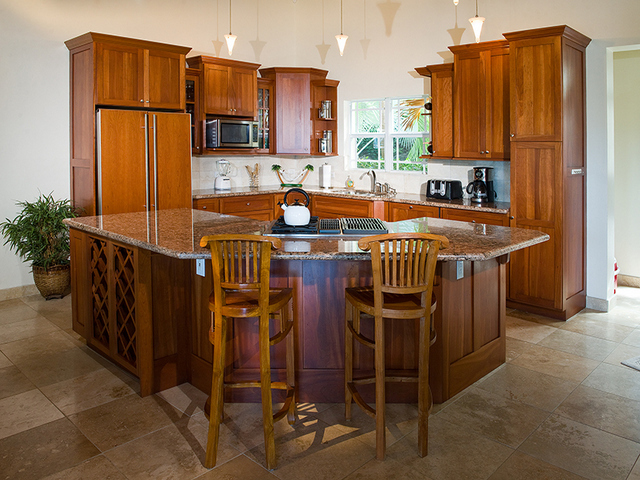 The large, fully equipped gourmet kitchen features mahogany cabinets, mahogany paneled appliances, and a central island with breakfast bar, cook-top and wine rack. 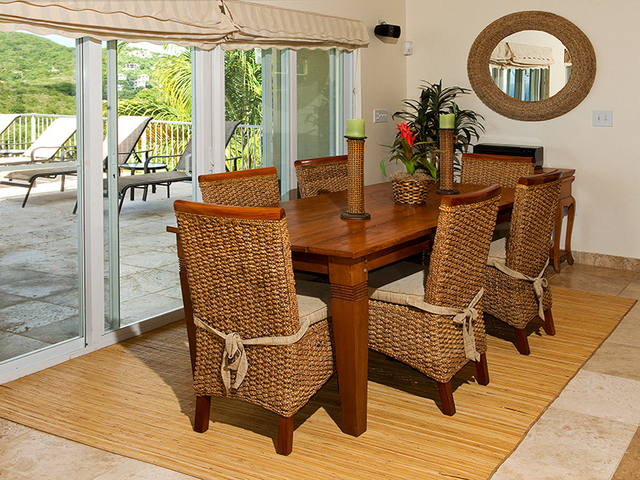 The indoor dining table seats six and there is a six seat custom teak dining set which beckons you to dine alfresco on the covered portion of pool deck. 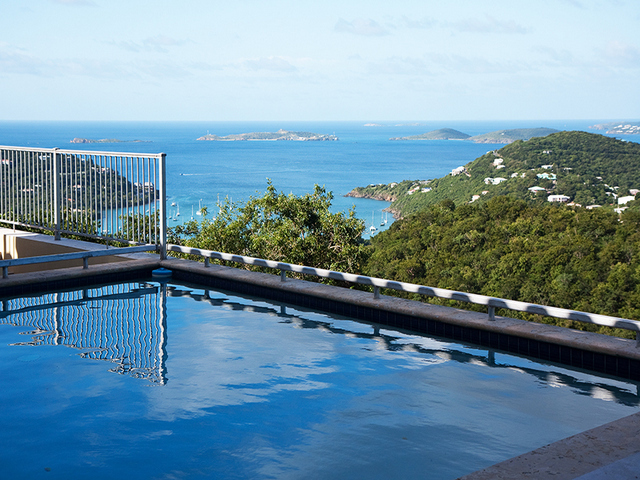 The pool deck features a 12’ x 18’ pool with submerged bench for relaxing in the cooling water. 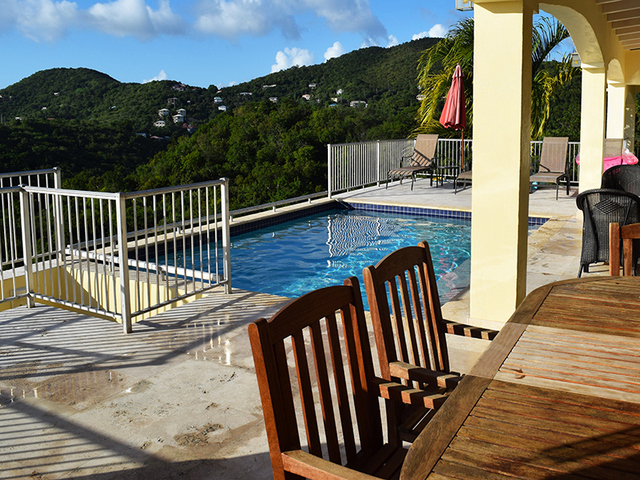 Lounge chairs are provided poolside for ‘soaking up some rays’. 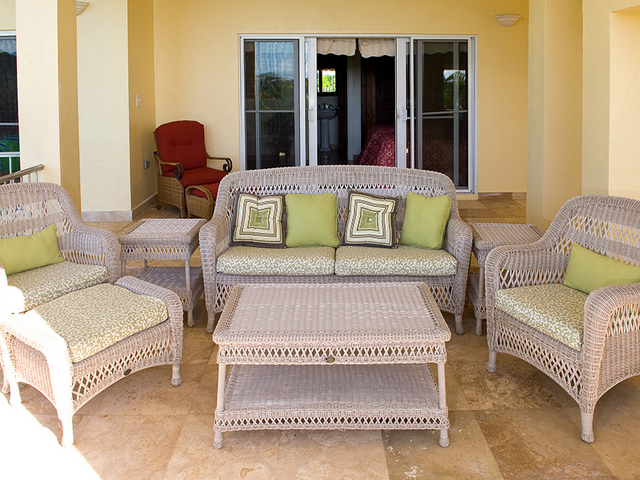 A cushioned rattan sofa and two chairs are located poolside under the veranda for enjoying ‘sun downer’ cocktails in the shade. 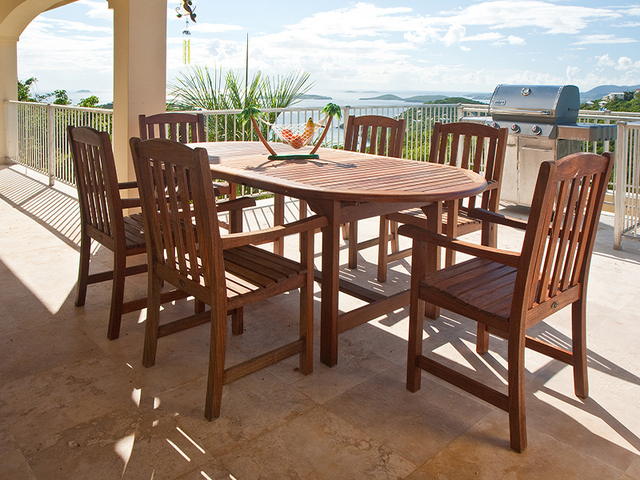 Prepare your alfresco dinner on the full sized stainless steel BBQ grill as you watch for the ‘green flash’ at sunset. 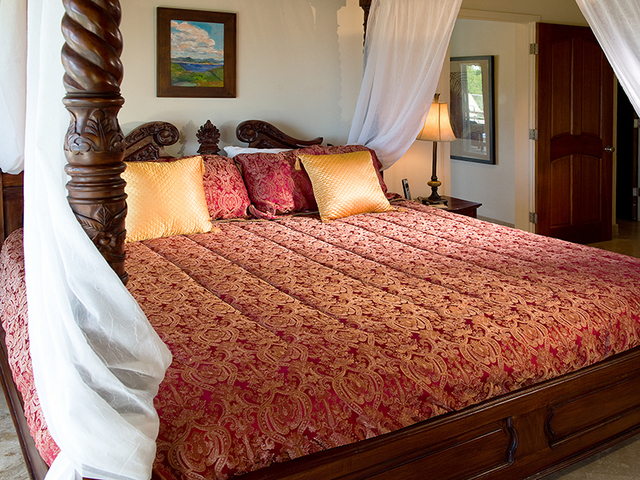 The two large master bedroom suites located on each end of the main level provide ideal sleeping comfort in over-sized four poster king beds draped in netting. These upper level bedrooms feature flat screen TV’s with satellite programming and DVD players located in beautiful armoires conveniently located for ease of viewing. 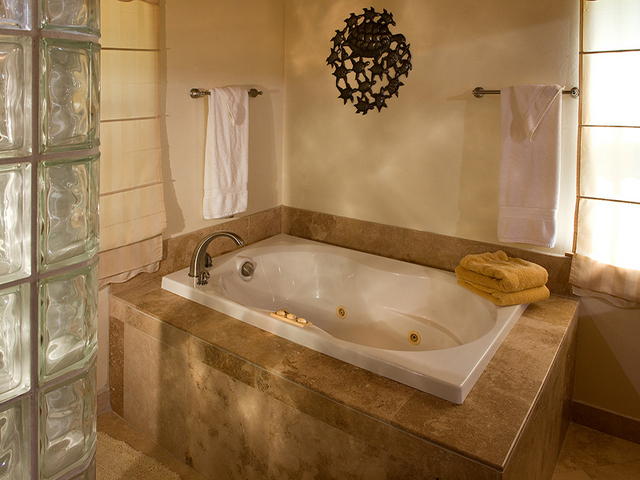 Walk-in closets and spacious en-suite baths with glass block enclosed showers and bathtubs complete the master bedroom accoutrements. 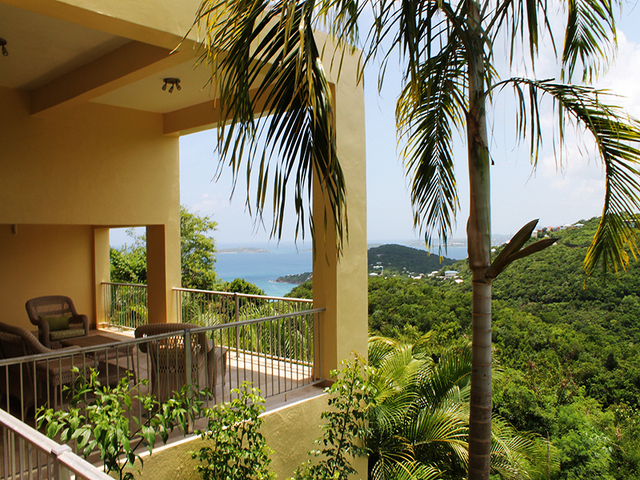 Both bedrooms access the pool deck via glass sliding doors and provide panoramic views of the Caribbean Sea. 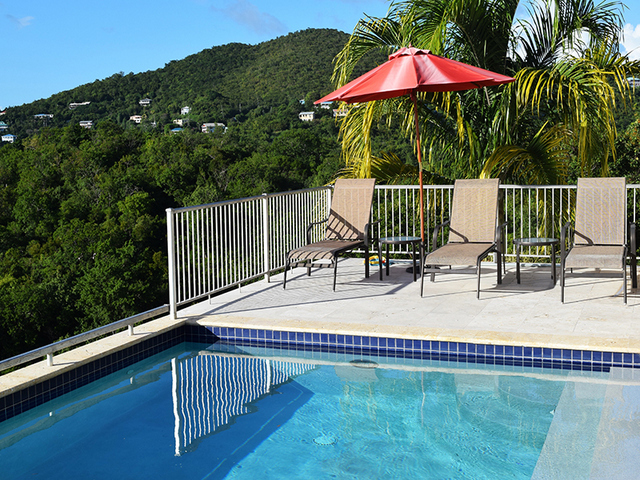 Descending the tiled staircase from the pool deck brings you to the lower covered verandas offering shaded lounging areas for relaxing with a good book or just laying around and ‘day dreaming’. A large hammock is available on one side of the veranda area for ‘just swinging’ in the breeze and is accompanied by an overstuffed lounger and side chair with ottoman. 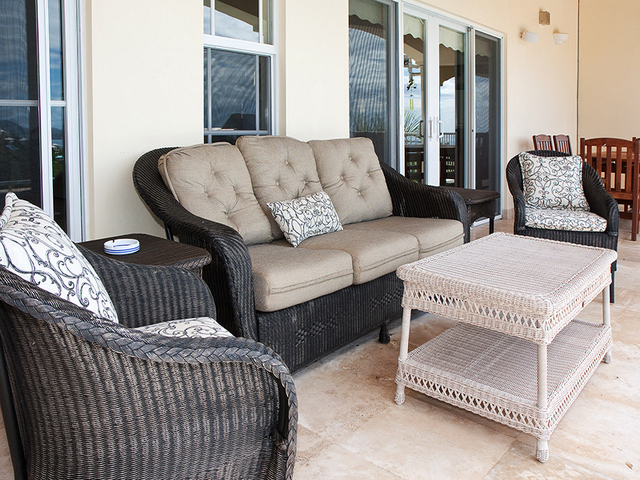 The adjacent veranda area has a quiet and comfortable seating area consisting of an overstuffed sofa and two chairs with ottoman. 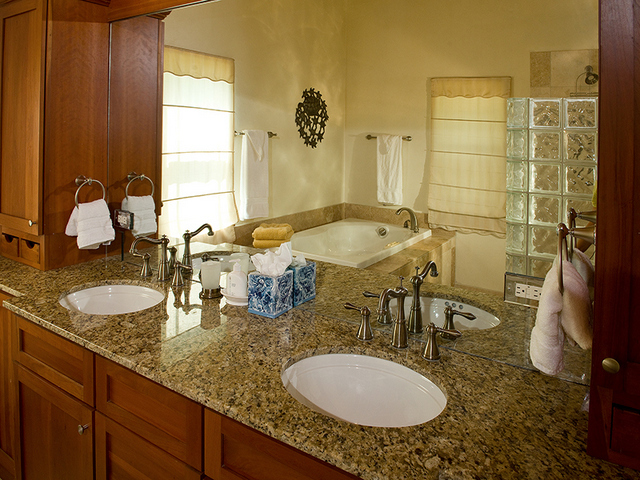 The lower level is also the location of the other three bedrooms suites, two of which have luxurious king size beds and large en-suite baths with walk in showers. 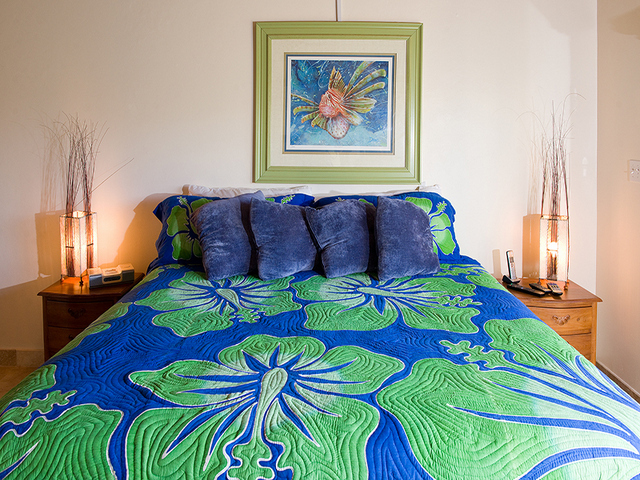 The third lower bedroom has two twin beds that can be converted to another king bed and an en-suite bath. 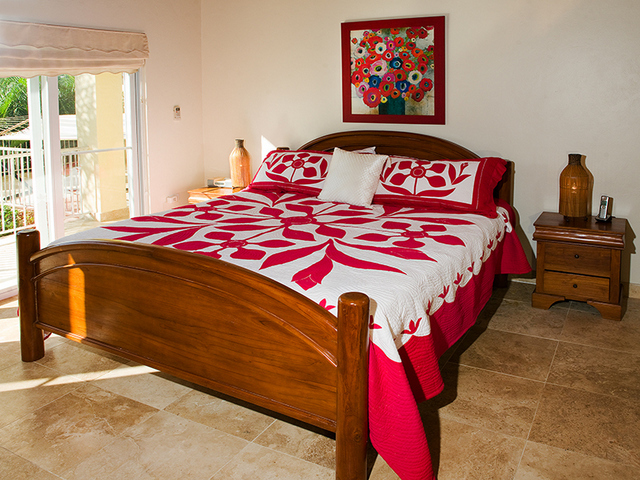 All lower bedrooms also have flat screen TV’s with satellite programming and DVD players. 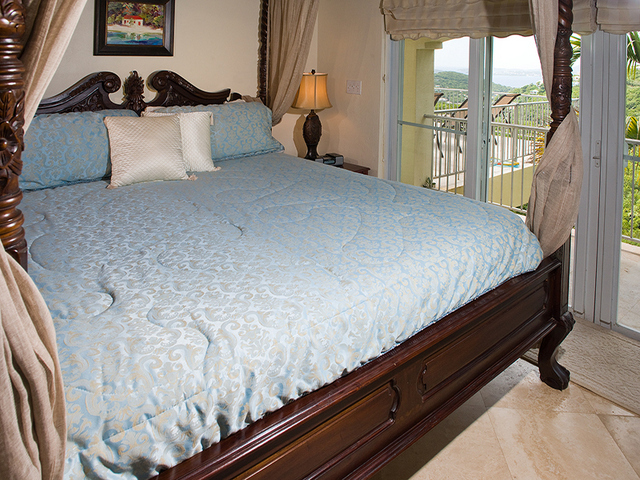 Each bedroom has large sliding glass and screened doors offering direct access to the shaded veranda deck and stunning views of the Caribbean Sea. 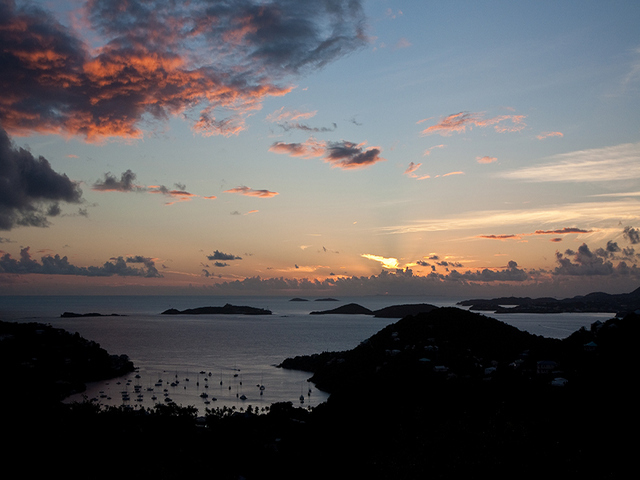 From the moment you enter Sweet Surrender you will know that you have entered a very special and unique place. 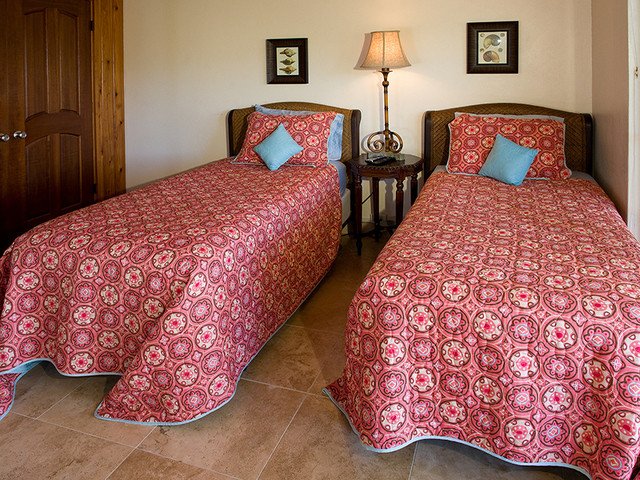 Rich in detail and affording the utmost in luxury vacation living, Sweet Surrender can take you to the land of SWEET enchantment where you will SURRENDER all of your cares and worries!